Winter is coming. It's going to be cold (gasp! ), snowy (shock!) and brutal (the horror!). Oh wait, those are all words we use to describe winter regardless of the year. But how much credence can you put into a forecast for winter that is published in August? Do we buy into it as meteorologists? In general, most meteorologists don't put much stock in this forecast. We see first hand how easily the forecast can change even within a week's time, let alone trying to forecast several months out. We can look at global patterns like El Nino and La Nina, but even those can't guarantee a winter projection, let alone pinpoint specific events 160 days or more out. The almanac's writers have never revealed how they make their forecasts. 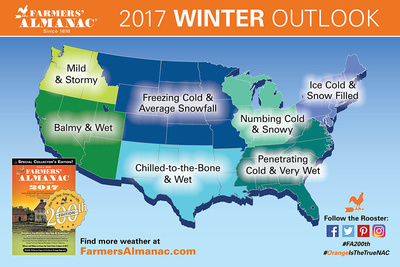 I've seen some forecasters directly compare the Farmer's Almanac forecast to the groundhogs in Punxsutawney, Pennsylvania. Here's what I got from the Farmers' Almanac forecast for the Tri-State after getting my hands on an early copy. Winter 2016/2017 will be colder than last year and could start earlier this year. Near normal snowfall is expected. However, the winter should be colder since El Nino isn't a factor this winter. El Nino typically leads to above-average winter temperatures, and that's what happened last year. In regards to snow, El Nino also lowered our snow chances last winter, so to call for near-normal snow this winter is a pretty broad statement. That's just my two cents. Your best forecast option for the winter and snowstorms that develop will always be your local meteorologist a few days before the event. Winter forecasting is notoriously difficult and often feels unpredictable to many of you. That's why the Farmers' Almanac is a fun read but shouldn't be used to figure out when school will be canceled or when you'll need to fire up the snowblower. 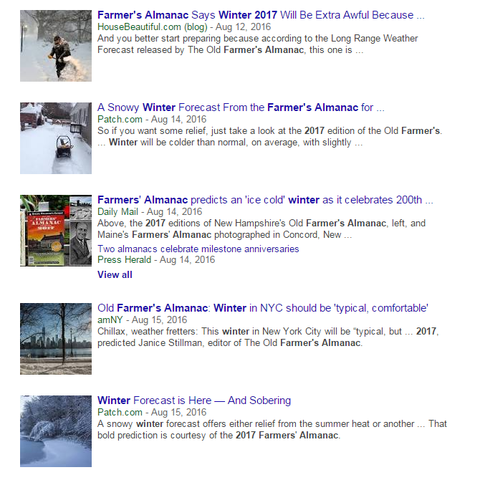 The 200th edition of the Farmers' Almanac is making headlines.